Percy Bysshe Shelley is a great romantic poet and idealist who believed in the happy future of mankind in which love, justice, and charity would prevail. He is also a revolutionary poet as he believed in social changes and moral reformation of mankind. “Ode to the West Wind” is a great poem which embodies some of his main ideas about man’s moral progress through the spirit of change from the old to the newer order. The west wind symbolizes destruction and preservation as it destroys the old leaves and preserves the new seeds. To Shelley’s mind, it appears as the destroyer of the old order and the preserver of the new. The west wind, therefore, becomes a symbol of change which destroys but at the same time creates. The poem is also a symbol of the reflective personality of the poet himself. As a boy, Shelley possessed the same impetuous quality like the wind itself; he is tameless, swift, uncontrolled and free. The west wind is regarded as a symbol which will bring about the golden age of mankind. 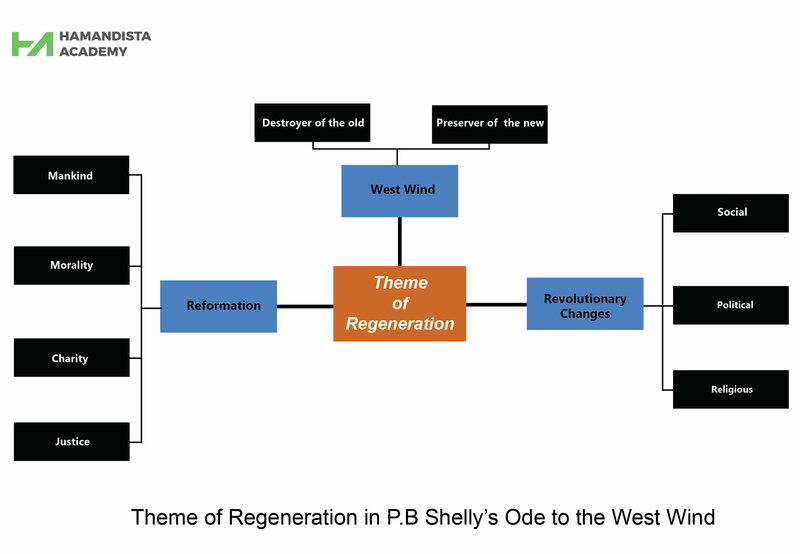 P. B. Shelley was a revolutionary poet and he was dissatisfied with the existing order of things. He hated political tyranny and the orthodox Christianity. He also hated wickedness, corruption, and evil which made human life very miserable and unhappy. He wanted to liberate mankind from the chain of political, religious, and intellectual slavery. This attitude is clearly reflected in the poem. The west wind is depicted as a symbol of those forces which will sweep away old order of life, old institutions and old. In the last stage, the west wind symbolizes the forces that will become perfect and when beauty and love will govern the universe. Shelley expresses the hope that his dead thoughts will quicken a new birth and will, therefore, bring about a revolutionary change in the social, political, and religious structure of human society. I fall upon the thorns of life; I bleed! This stanza shows poet’s awareness of the misery and suffering of human life. He wishes that he should be lifted like a leaf to scatter his thoughts about liberty and freedom for the welfare of mankind. In the fifth stanza, the poet becomes one with the west wind and he appeals to it to scatter his revolutionary ideas which will bring a new period in human history. Shelley believed in moral regeneration of mankind and it is through this moral revolutionary that a new society can be established where a man can live in peace and happiness. Shelley makes a prophecy about the coming of the golden age for mankind in the concluding line of the poem, when he says, “If winter comes can spring be far behind?” In the last stanza of the poem, we find a clear expression of Shelley’s idealism, his belief in the perfectibility of human nature and his belief in the golden age of mankind.